Thanks to the fact that DNA sequencing costs have decreased exponentially, researchers can now easily leverage the results of genome-wide association studies (GWAS), which include thousands of subjects, to mine for single nucleotide polymorphisms (SNPs)* that associate with blood levels of just about every major health-related biomarker. This is great news for our InsideTracker users, because we now have additional context to share with you regarding why your triglycerides or hsCRP (an inflammation marker) may be trending high despite your best efforts to keep them optimal – or, why it might be especially easy for you to keep them in check. * Quick high school biology recap: your DNA is composed of nucleotides, represented by the letters A, C, G, T. Different combinations of these letters make up different genes, and a single change in a letter, aka SNP, may correspond with different trait outcomes. SNPs themselves contribute relatively little to your overall susceptibility to changes in complex lifestyle-related blood biomarkers like fasting glucose, hsCRP, and cholesterol (i.e. even the best genes won’t save you if you’re into your 40s and party hard every weekend while sleeping less than 6 hours on average). But when SNP information is combined with blood test results, your DNA can be used as part of powerful personal health management tool. Theoretically, estimates of your risk for a particular trait based on genetics are the earliest possible measurements we can look to when it comes to helping to prevent disease. Combined with the trends from your blood test results, you get far more complete feedback on how your lifestyle is aligning with your innate genetic blueprint. 1. it can be used to inform therapeutic intervention – i.e., your predicted response to a drug. 2. it can be used for disease screening – i.e., assessing disease risk. 3. it can be used for personalized lifestyle-adjustment – i.e., what the InsideTracker DNA+blood product does. The latter of the three is useful even when we think we can’t do much about a particular blood related trait, because being aware of your genetic risk is often half the battle, especially if blood test results validate your genetic potential, as in the example shown below. Our ultimate goal is to have a fully integrated DNA+blood capability that incorporates all of the genetic markers that are most strongly associated with our blood testing. Working towards this goal over the past few years, it dawned on us that many of our users are already sitting on loads of potentially useful DNA data if they’d previously used 23andMe or Ancestry. So, we decided to roll out our DNA+blood product to enable you to upload your raw genetic data available from 23andMe or Ancestry in order to add blood biomarker test results to the mix, thereby revealing your genetic potential and offering increasingly personalized lifestyle recommendations. You might be wondering, “How does InsideTracker come up with SNPs that associate with HDL (cholesterol) for example?” As with everything we do here at InsideTracker, we let the science guide us. In the case of HDL, we looked to very large population-based studies called GWAS (using hundreds of thousands of subjects) that sequenced individuals’ DNA and used statistics to derive the SNPs that best explain why some people have higher HDL and others have lower HDL. As we mentioned above, any single SNP on its own is unlikely to explain much of the variability in HDL levels, but if we combine several of the SNPs that were found to be significant, we can come up with a polygenic (i.e. many genes involved) “genetic score” that might account for more of the observed differences in HDL levels between individuals. A genetic score also enables our scientists to simulate a population representative of our users in order to generate a distribution of scores that then allows us to tell you where you fall as far as your potential risk – i.e., for low HDL. Because we know which SNPs both 23andMe and Ancestry sequence, our algorithm can adjust the distribution of genetic scores to your own uploaded data in order to provide the most accurate estimate of your genetic potential. Let’s use triglycerides, since the heritability of risk for having high triglycerides is relatively significant at around 20% to 46% (1). Suppose Jane just joined the InsideTracker family and had her blood tested. Everything else looks okay, but she is trying to make sense of why her triglycerides came back so high. She avoids dessert, exercises daily, and generally avoids foods high in saturated fat. Why would her triglycerides be so high while most of her other biomarkers are normal? A clue could be in her genes. Luckily, Jane is also a 23andMe customer, and so she adds DNA to her InsideTracker test and uploads her raw genetic data, available from her 23andMe account. The InsideTracker algorithm now does the work for her, and provides her with a personalized PDF report comparing her DNA to her blood results. Jane’s report reveals that her genetic risk for high triglycerides is “increased”. 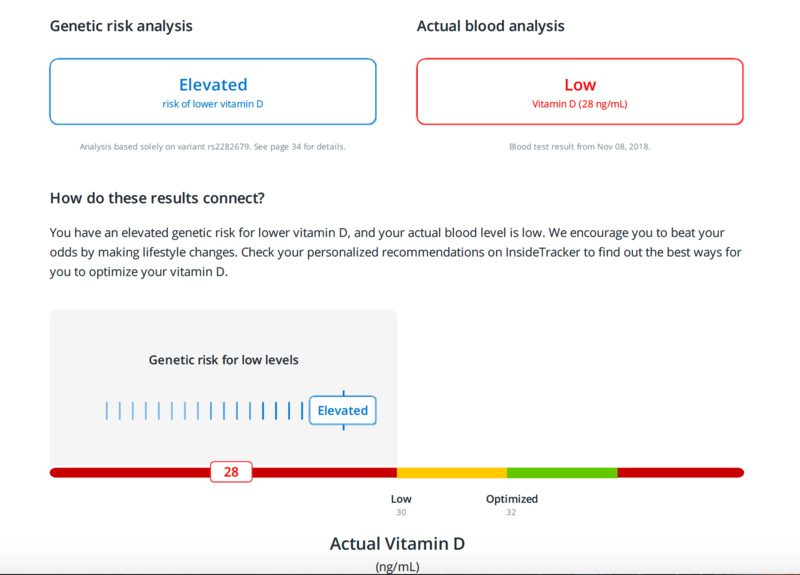 Armed with this awareness, Jane can now follow her personalized InsideTracker nutrition and lifestyle recommendations for addressing increased genetic potential for high triglycerides (2,3,4). Some of our more seasoned users who’ve taken our literature-based recommendations seriously for months to years, may find themselves smiling with the added context of their genetic predisposition. That’s because they might be looking at increased genetic risk for various biomarkers, while their blood test results show them something different. For example, Joe might have optimal levels of hsCRP despite having the genetic potential for high levels of inflammation. That’s because, as we always like to reiterate, lifestyle-based factors almost always have a more powerful effect on your metabolism and other complex traits than even the best genetic score. In fact, we like to think of our genetic scores as simply being indicators of how hard our users might need to work to reach the optimal zone for a particular biomarker. Before we wrap up, we want to remind you that not all of your tested blood biomarkers will have an accompanying genetic score. 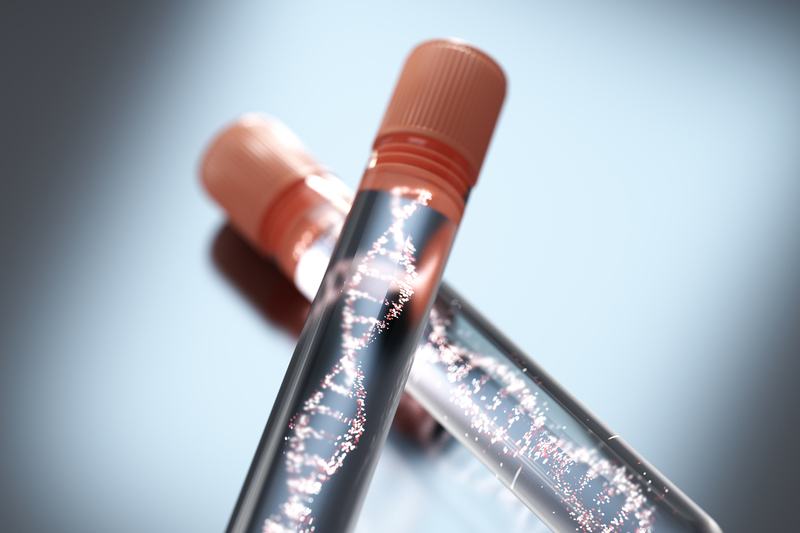 In some cases, we felt the available scientific research was not yet strong enough to support a significant association between genes and blood. There are also health-related genetic markers that stand alone, such as predisposition to high blood pressure or your weight-loss response to a higher protein diet. Finally, in the DNA+blood product, we also include genetic scores that estimate your relative potential to excel at aerobic vs. anaerobic type sports or exercise activities (shown above). While we think that the field of genetics-based exercise prescription is still in its infancy and not yet ready for implementation, we hope that having a general idea of where your natural athletic talent may lie could help generally guide you in your exercise regimen. This is a thrilling time for genetic science and personalized wellness, and as the two fields continue to unfold, we here at InsideTracker will continue to optimize the products and tools available to you to help you unlock your true potential.